I just wish it was today. Ooh my God!! Wow what a story that pierces the heart!! 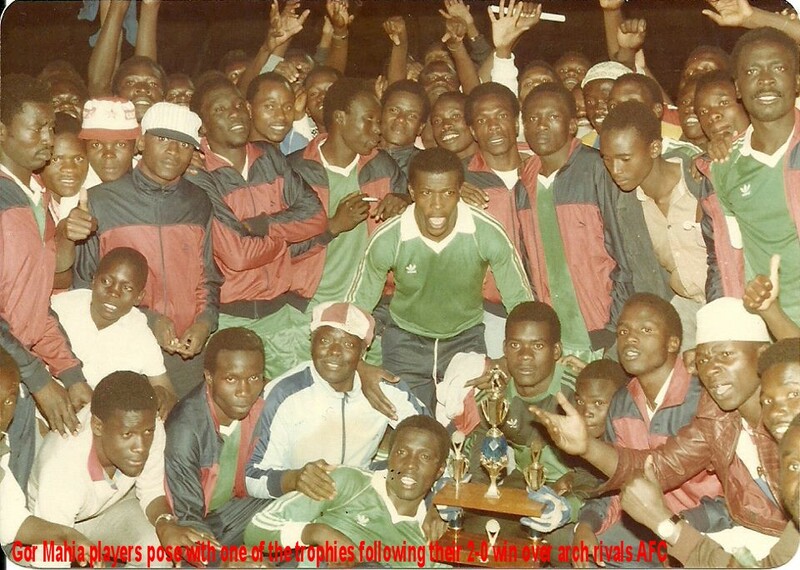 Obwakas’s name was on the lips of every KOgalo fan after the Khartoum conquest of AFC! May God bless the good Doctor wherever he is and also shower our great team with his special blessings as we try to reach for the stars!! Amazing! Simply amazing…..consider that this players never used to ask for salary , leave alone allowances!!!!!! Almost having a breakdown, Am really moved! Goro orange, zangi, nyangi odembo, owade zimbo and Obama you guys were a stroke of genius. No matter how others look at this thing, Amrouche was one of the best coaches Kenya has ever had. I liked the way he stresses discipline among players. He was arm-twisted to field Oliech on Sunday. I wish he applies for Gor Mahia job in future if it becomes vacant!! 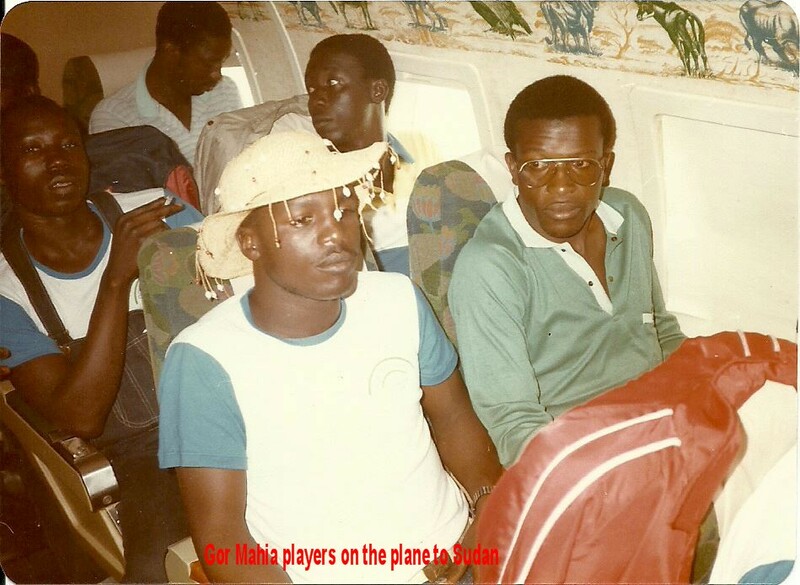 @Jakie, Owade Zimbo was never a Gor Mahia player. 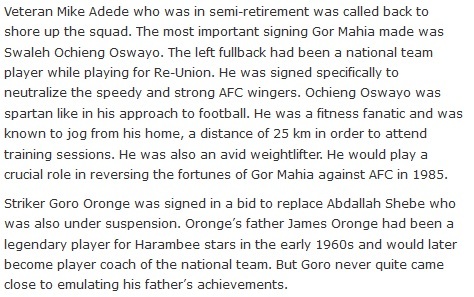 He schooled at Kakamega High School and played for Efusi but never for K’Ogalo. And Obama? Which Obama, Jakie? Gor Mahia EC should not let FKF take Our Scotsman BW for free. Quote a fee or else they look for a Chinese coach. wow! lived in donholm during the time. remember how gor fans kept sweeping outering et jogoo road. 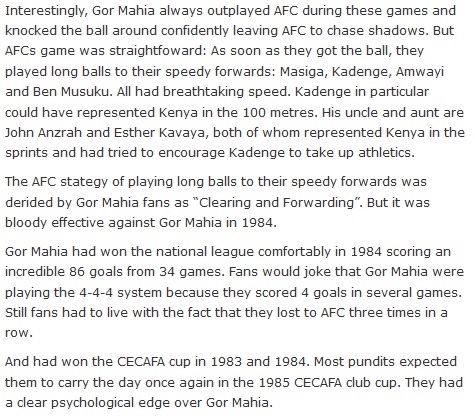 those days gor afc match was simply electric. the matches could be discussed the whole day. i must admit i admired the afc of then. abdul baraza, okwaro, musuku etc. these guys used to tear gor at nyayo and i too admit to hating nyayo stadium. masiga and musuku simply owned the stadium, and that guy called abbas. 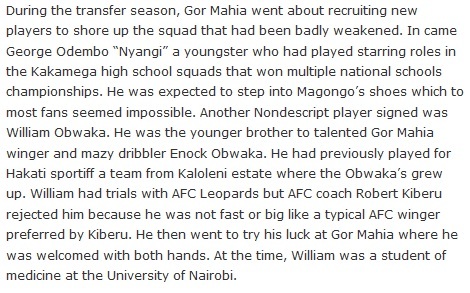 how we ‘hated’ you for stopping gor everywhere. bassanga chasing mususku was like watching a vw chasing a porshe carera. 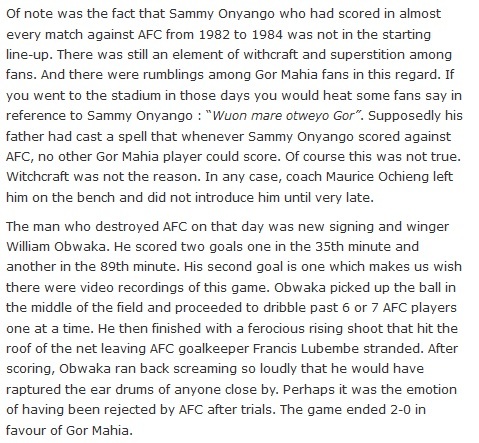 but until one guy called sammy onyango showed up. then nyangi, dawo and the tide changed. 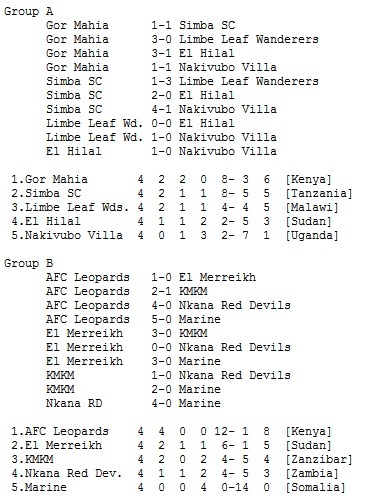 gor simply jumped over afc and took on africa. 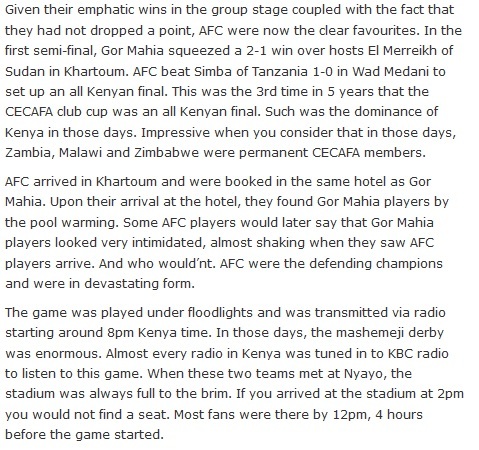 strangely enough afc could never fight well outside kenya while gor simply teared opponents in their homes. truly afc had one of the best squads any coach would kill for but gor of zamalek was devastating. the gor semifinal match vs dragons with rufai on goal… i think my heart stopped severally on that day. What a story!!!! I was in std 5 by then, KBC was first class, we listened to the match with my dad and other neighbors, Both gor and AFC fans. The good thing is that we never fought. It was one of the sweetest victories Av ever experienced. Lots of appreciation for the writer. @dan original, Bobby is the head coach of harambee stars but I think he will still serve both roles until end of season!!!!! Nothing much to worry about for now….. 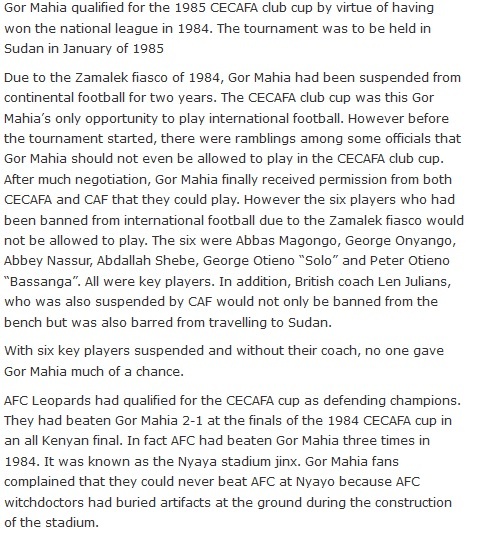 I remember with nostalgia that night my beloved club lifted cecafa cup. 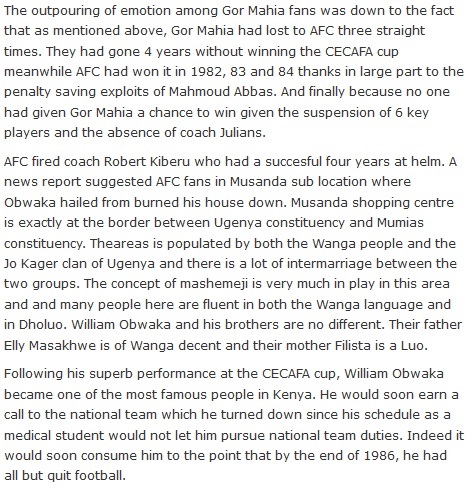 My late dad,Nicholas Okello Kasera,and I were following the match live via KBC commentary by Leonard Mambo Mbotela.Though it is many years ago,I can still visualise how we danced in our house in milimani Kisumu.How I still love Gor Mahia F.C.!! 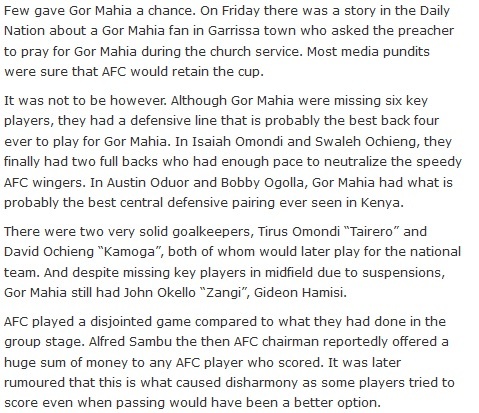 No wonder I av vowed to give ksh 200/- via 350100 per month….Kogalo, Gor Gor Mahia timbe duto ywakni. I like. I was young and I can remember me and my sister were qlued to KBC with Naftali Nick Okanga live from Khartum. Wow! just no word to describe what i would have felt suppose i would have been there!..pure super-nostalgic..FORZA GOR MAHIA FC.